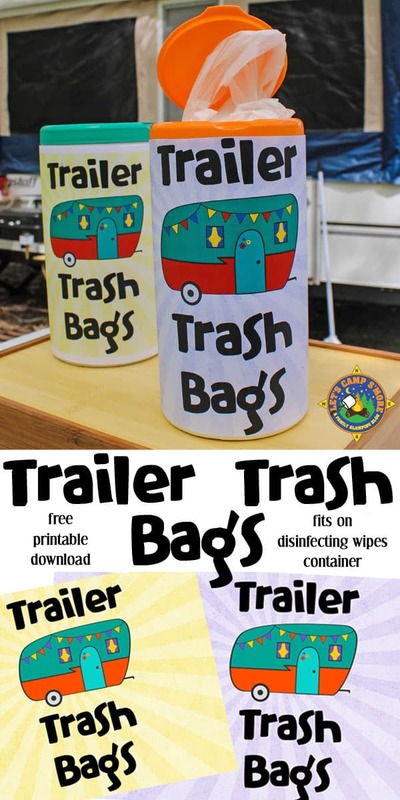 Use this Trailer Trash Bags printable to turn a container into a bag holder. When we camp, we use plastic store bags to collect our trash. 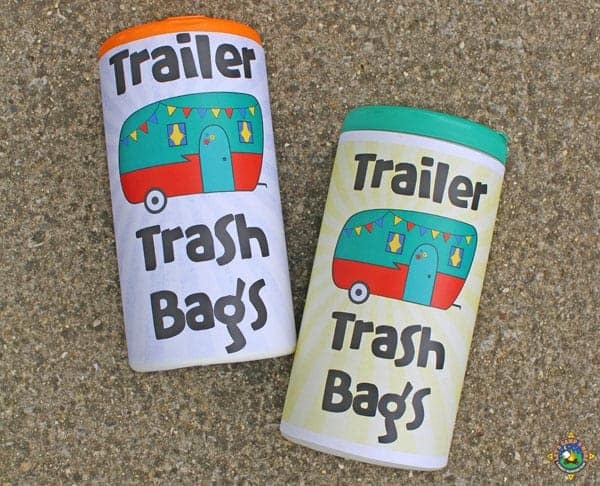 They are the right size for holding a day’s worth of trash. We throw them out each night as to not attract animals. We used to have these bags stuffed here and there and couldn’t seem to find one when we really needed it. I decided to get a container to hold bags. I realized a disinfecting wipes container was the perfect size for holding bags. 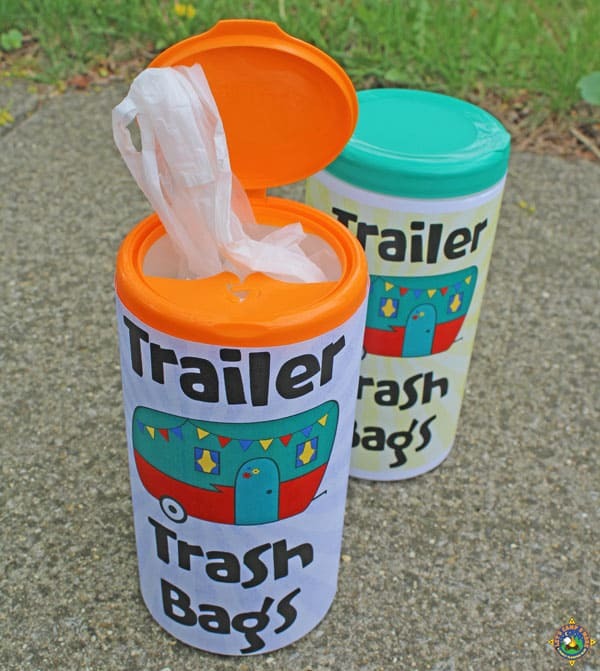 Instead if just writing on the used container, I created a cute Trailer Trash Bags label to wrap around the container. I’m providing them as a free download for you to use. Get the download at the bottom of the post. Remove the label from the wipes container. 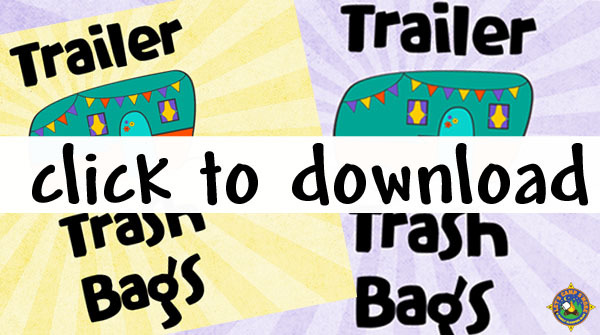 Download and print the Trailer Trash label. Please note that the free printable comes in two sizes. The larger will print on one legal size paper. The smaller prints on two letter size papers. Cut the printable to fit the container. Tape one edge of the label in place to the back of the wipes container. Wrap around the container and tape the other edge in place. How cute is that? I created the labels in colors that match the four colors that disinfecting wipes come in. 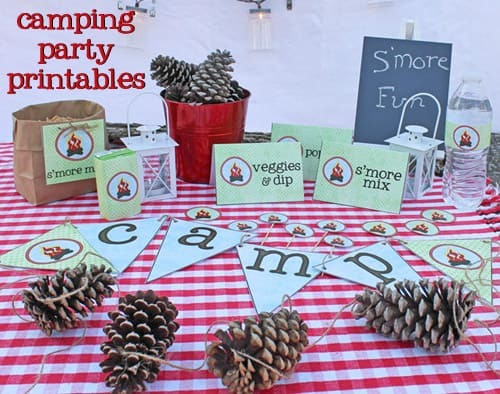 The printables come in two sizes. You can print the one large printable on legal paper or the smaller two-part on regular paper and tape it together to fit the container. So cute! Plus this is the perfect size to keep in the trailer.